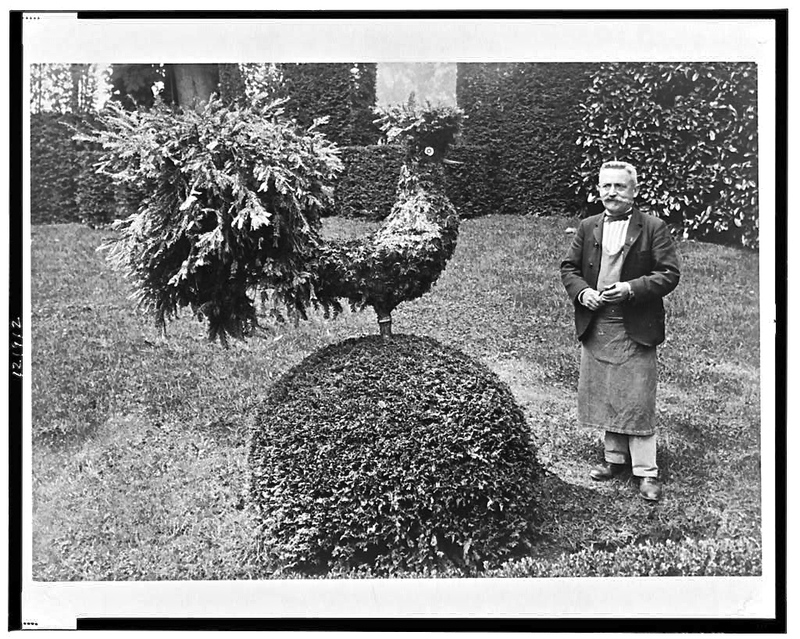 “Gardener standing alongside shrub trimmed into shape of a rooster, in garden at Villa Trianon, France,” about 1925. Click the photo to enlarge. I have looked at a lot of photographs of topiary lately, but this one is particularly spiffy (beau, somptueux, resplendissant). It’s from the Frances Benjamin Johnston Collection of the Library of Congress Prints and Photographs Division. Frances Benjamin Johnston (1864-1952) was one of the first American women to achieve prominence as a professional photographer. After studying art in Paris, she returned home to Washington, D.C., in the 1880s and opened a photography studio about 1890. Her family’s social standing gave her access to the capital’s elite, including the First Family, politicians, and diplomats, and her business soon took off. In the 1910s, she turned to garden and estate photography. Thank you for sharing the archival photo. Strangely, topiary is the official art of Bishopville, a rural, depressed town in South Carolina. A walk through Pearl Fryar’s curious gardens sparks the imagination. Fryar’s work is amazing. Your blog is very interesting too.